Attacked: The Communication Workers of America with the AFL-CIO produced a coloring book attacking the Teamsters. 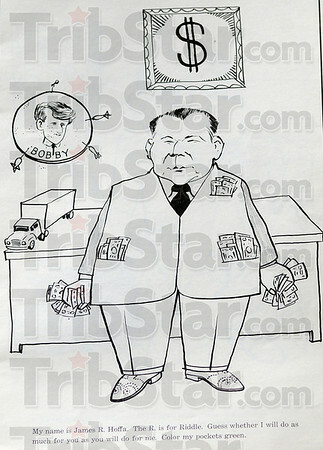 The first image in the book is of Jimmy Hoffa with his pockets stuffed with money. The caption reads: “ My name is James R. Hoffa. The R. is for Riddle. Guess whether I will do as much for you as you will do for me. Color my pockets green.” The book is part of the Hoffa collection in the Clay County Historical Museum.